For a truly relaxing Missouri getaway, make reservations to stay in our Gallagher Room at Hawthorn B&B. Named after John Gallagher, who built Hawthorn in 1900, this inviting guestroom is decorated in Victorian, turn-of-the-century style, featuring rose walls and floral and dark green accents. Some of the owners’ childhood belongings, a christening dress, baby shoes, and teddy bear, lend nostalgic charm to the room. The carefree innocence of childhood is depicted in artwork throughout the Gallagher Room as well. Another distinguishing feature of this room is its full closet; closets were taxed extra back when the house was built in 1900, so the other rooms have wardrobes. After a day of exploring the Independence/Kansas City areas, refresh yourself in the en suite bathroom, which features a standing shower with glass door (no tub). Then relax with a book or write out some postcards to folks back home at the desk in the sitting area before retiring to the comfort of your cozy bed. Awaken in the morning to the aroma of a freshly brewed coffee right outside your door then experience your specially prepared, full, home-cooked breakfast awaiting you at your private table . The owners will be glad to offer their expertise of the area to help you plan the rest of your day, so you’re sure to spend your time here doing the things you like most. 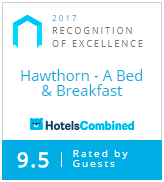 Contact us soon to make reservations for your memorable stay at Hawthorn. We look forward to seeing you! It was great fun sharing our adventurous “girls weekend” with you two. Your hospitality and graciousness is the Best.